If aren’t familiar with the recent controversial changes at Facebook, read our posts here and here. Two new related products were launched, News Feed and Mini Feed, which give Facebook users a quick view of what they and their friends are up to – relationship changes, pictures and comments added, etc. Hundreds of thousands of Facebook users, unhappy with the perceived privacy issues brought up by the new products, quickly organized anti-Facebook groups to demand a roll back of the new products. Founder and CEO Mark Zuckerberg made an initial statement immediately afterwards, saying that Facebook was listening to its users and contemplating changes. This morning, Facebook released tweaks to the products that should as assuage even the most angry Facbook users. So we have been coding nonstop for two days to get you better privacy controls. 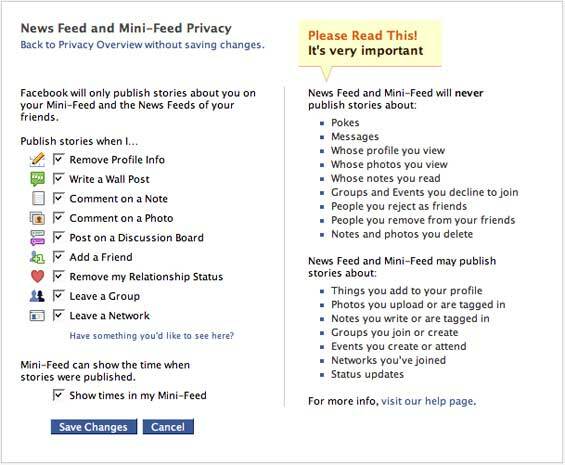 This new privacy page will allow you to choose which types of stories go into your Mini-Feed and your friends’ News Feeds, and it also lists the type of actions Facebook will never let any other person know about. Anyone who isn’t comfortable having some or any of their personal information included in the feeds can now have it removed. Facebook is also auto-removing some of the data that people complained about most – status changes, groups added, etc. (see screen shot below shows the settings).